Rugged design matched to an immediate, plug-and-play interface - what's not to like? Rugged build quality and all-metal casing. Open, warm preamps and A/D signal conversion. Impressive value. US-4x4 phantom power should be switchable in pairs. Tascam's relationship with 'audio capture' now spans many separate approaches. Currently, its product range is perhaps best known for field recorders, but Tascam also has a range of Digital Portastudios, designed to provide all-in-one multi-track recording systems, dedicated digital signal processors, a collection of products for iOS devices and a growing range of audio interfaces. Into this latter category comes the US-2x2 audio interface. This comes in as the foundation level product in the US range, under more fully spec'd interfaces further up the product line. As you'd hope, this also makes it the most affordable interface in Tascam's line-up. The interface is Mac and PC compatible and the 2x2 is buss-powered via its USB connector. Starting with this more compact interface, what's immediately notable is that, in comparison to the lightweight construction and feel of some rival interfaces, Tascam's smallest model is reassuringly rugged. "Performance is impressive with a warm, clean sound achieved when recording both instruments and vocals"
This quality is reinforced by aluminium end-cheeks whose design cunningly raises the front-panel a little off your desk, so that accessing its controls is easier. At the back, you'll find a modest array of essential connectors: a 1/4-inch, balanced stereo output pair (somewhat unconventionally labelled 1 and 2 rather than left and right), MIDI In and Out connectors and the all-important USB connector. There's also an option to connect a 5V DC power supply but, if required, you'll have to purchase this separately, as Tascam don't provide you with one themselves. The front panel is rather busier. Here you'll find two recording channels which both offer combi XLR and 1/4-inch inputs. Phantom power can be globally switched on for both via a single switch but otherwise the controls for each channel are independent. These include a Gain dial, as well as the option to switch between Mic/Line and Instrument inputs. LEDs light green when a signal is detected for either channel, while another lights red if you over-cook levels into Peak territory. To the right of the inputs, the output section provides independent Line Out and Headphone monitoring level dials, while you can balance signals between live input monitoring and the return signal coming from the computer. This makes it easy to balance volume for singers and instrumentalists against the track to which they're adding their recording, without the need to create a balance in your host software. This is further enhanced by Tascam's promise of latency free recording. Feature-wise, that's your lot. Simple, compact and with a bare minimum of fuss. Setting the unit up to work with your computer is similarly quick. We tested the 2x2 with a Mac and it required no further mandatory drivers; plug it in, select the interface via your host's audio preferences and you're good to go. That said, a driver is required for PC users and there are advantages to downloading the Mac equivalent too, as the Software Panel it provides allows you to readily configure parameters including recording quality, which is offered at settings up to 96kHz at 24-bit resolution. Tascam's mic pres are designed for low noise, with a signal-to-noise ratio of 101dB, which Tascam claim out-performs almost all other interfaces at this price range. Certainly, performance here is impressive with a warm, clean sound achieved when recording both instruments and vocals. The only obvious limitation here is the provision of just a pair of input channels, so if your requirements go further but you like the sound of the 2x2, its bigger brother might suit you better. 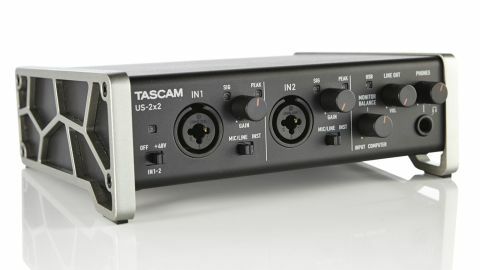 "Alongside connections to computers, Tascam's iOS know-how is built into the device too"
Also available in the same series (for extra outlay) is the US-4x4 interface, as its name suggests, has not only four inputs but two additional outputs. It provides exactly the same build quality and a similar feature set to the 2x2, though there are a couple of differences. The 4x4 is not USB buss-powered, so an external power supply is provided in the box. The 4x4's additional two outputs are found on the back panel, while the front panel offers a second headphone port so that two pairs can be connected at once. A little disappointingly, phantom power is still only switchable on/off for the 'whole' device - while this makes sense on the 2x2 interface, we'd have preferred the 4x4's inputs to be switchable in pairs. Alongside connections to computers, Tascam's iOS know-how is built into the device too, with direct connections to iPads and other iOS devices offered via Apple's Camera Connection Kit (sold separately), meaning that if you're looking for a tactile, flexible front-end for ultra-portable recording system, both interfaces pack an impressive punch. Only you'll know which of the two designs suits your recording needs but we'd have no hesitation in recommending either as great examples of just how much audio interfacing quality is available for relatively little outlay these days. Consider that purchasing either of Tascam's newbies also provides a licence for Ableton Live Lite and Sonar LE and, if you really are on a shoestring budget, your sequencing needs are at least initially met too. It's a buyer's market for interfaces of this type right now, with many manufacturers offering comparable specs to those offered by Tascam's US range, so it's worth checking out the competition too. But the key ingredients are certainly here, with high-quality preamps, warm, open signal conversion and immediate, plug-and-play operation, particularly if you're working on a Mac. If you're shopping for an interface with modest I/O and just such a level of immediacy, Tascam's new US series interfaces should certainly be added to your 'must try' list.